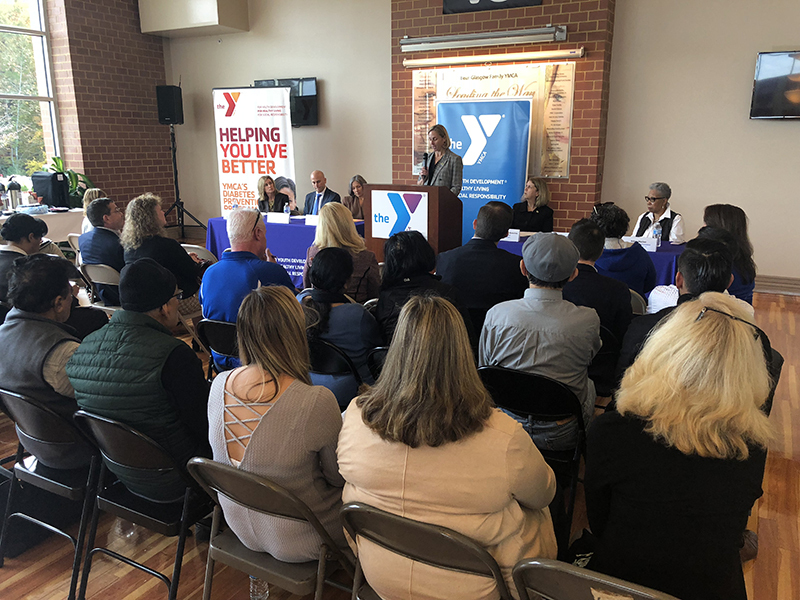 In November, the YMCA of Delaware hosted a press conference at the Bear-Glasgow Y to announce the launch of the Medicare Diabetes Prevention Program. The Y of Delaware is one of the first organizations in this country certified to offer the Diabetes Prevention Program as a covered benefit for eligible Medicare recipients. During the press conference, representatives from Y-USA, Highmark Delaware, Centers for Medicare and Medicaid Services, Delaware Benefits and Insurance Coverage, and a participant from the YMCA’s Diabetes Prevention program made remarks to support the launch of the new program. The YMCA’s Diabetes Prevention Program is a group-based lifestyle intervention for adults at high risk of developing type 2 diabetes. The program has been shown to reduce the number of new cases of diabetes by 58 percent overall and by 71 percent in adults over 60. Statistics from the Centers for Disease Control and Prevention show that 84 million people in the U.S. have prediabetes; yet only 10 percent are aware they have the condition. Without weight loss and moderate physical activity, 15 to 30 percent of people with prediabetes will develop type 2 diabetes within five years. Having prediabetes means a person has elevated blood glucose levels that are not high enough for a diabetes diagnosis. The YMCA’s Diabetes Prevention Program is a year-long program consisting of 25 group sessions. In a relaxed classroom setting, a trained Lifestyle Coach helps participants learn skills to help them incorporate healthy eating, increasing physical activity and other behavior changes into their everyday lives. The goals of the program are five to seven percent weight loss and an increase in physical activity to 150 minutes per week. In Delaware the YMCA has served approximately 2,000 participants, in all 3 counties, with an 82 percent retention rate. Additionally, program participants achieve an average weight loss of 5 percent and 187 minutes of physical activity per week. Press conference at the Bear-Glasgow Y to announce the launch of the Medicare Diabetes Prevention Program.